"Stand on the Shoulders of Giants"
Dry ice experiments are fun. The ice is an interesting substance to play with. 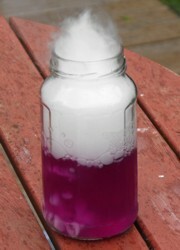 If you have had your own experiments and experiences with dry ice and you would like to share them. Go to share or read about shared experiments! Stay updated and subscribe to "Science News For Kids" our monthly e-zine. Dry ice is solid carbon dioxide at the temperature of -109.3°F or -78.5°C. The reason it is referred to as dry-ice is because it sublimates at normal atmospheric pressure. This means instead of melting and turning into a liquid then evaporating into a gas it skips the liquid phase completely and turns straight into a gas. This is useful if you want to keep something cool, but not get it wet. This is why it is sometimes used to transport goods which need to be kept at a low temperature. Dry-ice was discovered in the 1800’s as chemists were trying to study the property of liquid carbon dioxide which had to be pressurised to be in liquid state. Then they noticed that when the chamber was depressurised a white kind of snow was left which was dry-ice. and what it does is displace oxygen choking the fire. This is why it should always be used in well ventilated areas. ice cream. You can also put it in drinks and watch them bubble and as a bonus it cools your drink as well. Share your experiment related to this topic. Do you have a great experiment or experience related to this page that you would like to share? Share it! Entering your story or experiment is easy to do. Just type! Your story or experiment will appear on a Web page exactly the way you enter it here. You can wrap a word in square brackets to make it appear bold. For example [my experiment] would show as my experiment on the Web page containing your experience. Go back from "Dry Ice experiments" to the home. Copyright © 2011-2016 K.C. All rights reserved.